If you’re going to ask an audience to sit for 2 ½ hours in an older theater without air conditioning on a genuine Hot August Night, it’s a good idea to offer free bottled water, ice cream sundaes at the end, and top-flight entertainment. Light Opera of Portland (LOoP): Water? Check. Ice cream? Definite double check. Top-flight entertainment? Amazing triple check – this production of Iolanthe is a must-see for local audiences with a passion for Gilbert and Sullivan’s wryly absurd musicals. Artistic Director Dennis Britten and Musical Director Linda Smith have teamed up to once again mold a talented cast into a whole that is much greater than the sum of its parts. The cast is loaded with strong vocalists, some new and many of them veterans of previous LOoP productions. The ensemble work is powerful, intricate, and often quite beautiful – but most important, it’s just plain fun. A show selling its underlying themes (satirizing the absurdity of both political and sexual norms, in some ways as appropriate today as when written) through an utterly nonsensical premise can easily turn into slapstick unless the cast and production team take an unwaveringly serious and professional approach – and LOoP cannot be faulted on this count. Utterly nonsensical? Try this: Iolanthe is a fairy, banished from fairyland for marrying a mortal. Some 25 years later, the Queen of the Fairies relents, and allows Iolanthe to return from exile. Everyone is shocked to learn that Iolanthe was pregnant when banished, and now has a 24 year-old son – a half-human, half-fairy Arcadian shepherd named Strephon. Strephon is engaged to the fair Phyllis, an Arcadian shepherdess who is also, remarkably, a ward of the British chancery (the geographic gap between Greece and Great Britain being conveniently overlooked). Phyllis is not yet of age, and needs the permission of The Lord Chancellor to marry – but all of the members of the House of Peers are infatuated with Phyllis (including the Lord Chancellor). Phyllis, who does not know about Strephon’s hybrid genealogy, believes her beau has cheated on her when she sees him embracing a young, beautiful woman (his mother Iolanthe, who looks 17 because she is a fairy and does not age quite like the rest of us). All this, and we’re barely half way through Act I! The story ostensibly revolves around Phyllis and Strephon, ably portrayed by Lindsey Lefler and Laurence Cox. Lefler shifts from wide-eyed innocent to determined lover, seasoned with bouts of petulance – all expressed through flashing eyes, a melting smile, and her pitch-perfect soprano delivery. Cox brings a solid voice to the role, while capturing the contradictions inherent in his fairy/human background – a slightly androgynous affect consistent with being fairy on the top half, human on the bottom, and “extremely pretty, but inclined to be stout.” However, many of the show’s most charming touches come from other characters – on team fairy, particularly Sarah Ominski’s politically astute and mischievous “Leila,” Jan Rosenthal’s bumbling “Fleta” (watch for her shoes! ), and Sheryl Wood’s mercurial “Queen of the Fairies.” Gilbert and Sullivan wrote the peers as stuffed shirts utterly bereft of any redeeming social value, but the tradeoff is that they get most of the really funny lines – Rob Patrick (“The Lord Chancellor”), Mark Flannery (“Earl of Mountararat”) and Dennis Kelly (“Earl of Tolloller”) are hilarious in a couple of debates about their relative suitability as Phyllis’ mates. Additionally, Kelly’s surprisingly powerful voice firmly anchors the male vocal ensemble. The show is done with just two sets – a pleasant woodland scene for Act I, the London skyline for Act II – so no time is lost to scene changes. Woody Woodbury’s guardhouse is particularly detailed, and subtly (perhaps inadvertently) captures a timelessness consistent with the show’s comic surrealism. Costume designer Sandra King has done well by both fairies and peers, although perhaps the male ensemble would appreciate fewer layers of tuxedo and ermine on hot nights! Finally, pianist Linda Smith’s musical direction is flawless. With just piano, flute, occasional trumpet, and vocals she more than satisfies the complex demands of light opera. The Alpenrose Dairy Opera House has fine acoustics and ample space to accommodate the audiences that this show deserves. With only a two-week run, don’t delay – this offering may not appear on a Portland stage again for a long, long time! 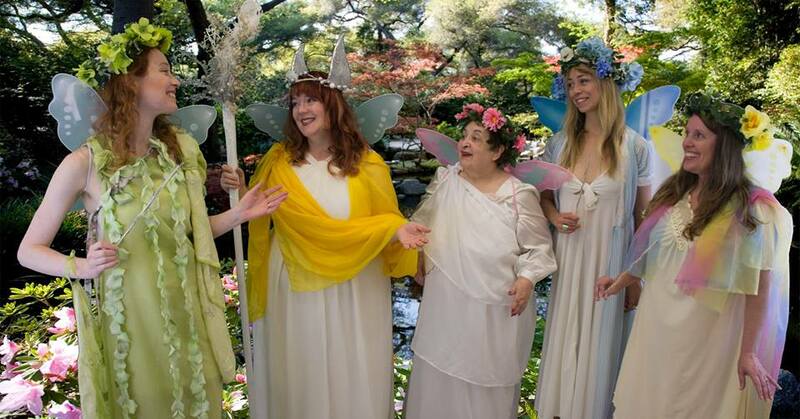 LOoP presents Iolanthe through Sunday, August 28th with performances at 7:30 on Friday and Saturday and 3:30 on Sunday at Alpenrose Dairy Opera House, 6149 SW Shattuck Road, Portland.